Although various endothelium-dependent relaxing factors (endothelial autacoids) are released upon the elevation of endothelial cytosolic free Ca2+ concentration (EC [Ca2+]i), the quantitative relationship between EC [Ca2+]i and vascular tone remains to be established. Moreover, whether the basal release of endothelial autacoids is modulated by basal EC [Ca2+]i is still unclear. We assessed these issues by using a novel method that allows simultaneous recording of EC [Ca2+]i and vascular displacement in dissected rat aortic segments. Receptor-dependent (acetylcholine) or independent (ionomycin) agonists caused immediate EC [Ca2+]i elevation followed by vasorelaxation in preparations pre-contracted with phenylephrine. Low doses of agonists induced small EC [Ca2+]i elevations (about 100 nmol/L) and concomitant half-maximal vasorelaxation. At high doses, agonists elevated EC [Ca2+]i to μmol/L range with little additional vasodilatation. When EC [Ca2+]i was plotted against the vasorelaxation, the curves were almost identical for both acetylcholine and ionomycin treatments, in the presence or absence of various endothelial autacoid inhibitors. Calcium-free solution reduced basal EC [Ca2+]i and induced a drastic vasoconstriction. Endothelial autacoid inhibitors reduced EC [Ca2+]i changes and abolished both agonist-induced vasodilatation and calcium-free solution-induced vessel contraction. When the EC [Ca2+]i was completely chelated by 40 μmol/L BAPTA, the acetylcholine-evoked vasorelaxation could be abolished as well. However, when the EC [Ca2+]i was partially chelated by 20 μmol/L BAPTA, the acetylcholine-evoked vasorelaxation was almost unaffected. These results indicate that vascular tone is modulated by subtle changes of EC [Ca2+]i level, which seems to serve as an integrating signal in both basal and stimulated states. Vascular endothelium plays an important role in controlling vascular tone by secreting a variety of endothelium-derived relaxing factors (endothelial autacoids), namely NO, prostacyclin (PGI2), and L-NNA/indomethacin-insensitive relaxing factor [1,2,3]. In response to various chemical and physical stimuli, an elevation of endothelial cytosolic free Ca2+ concentration (EC [Ca2+]i) followed by the activation of calcium-dependent enzymes/channels and the consequent production of endothelial autacoids . Although EC [Ca2+]i appears to mediate the release of endothelial autacoids, the direct relationship between EC [Ca2+]i and vascular contractility in intact vessels remains to be established. Among all three calcium-dependent endothelial autacoids, NO is the primary regulator responsible for the modulation of vascular tone. The administration of NO synthase (NOS) inhibitors increases blood pressure , indicating an important role of NO on the regulation of basal tone. The basal EC [Ca2+]i level in intact rat aorta [6, 7, 8] or in culture (ref. as an example) is less than 100 nmol/L. Studies using purified endothelial NOS or EC membrane fraction indicate that EC NOS may exhibit a basal enzyme activity under an extremely low calcium level [10, 11], suggesting that EC [Ca2+]i under basal conditions may be too low to regulate the minimal activity of EC NOS. Moreover, it has been reported that isometric contraction induces a calcium-independent activation of endothelial NOS . Nevertheless, the EC [Ca2+]i level was not monitored in these studies. Therefore, the role of EC [Ca2+]i level under basal conditions remains ambiguous and still needs to be validated. Here we reported the development of a novel method that allowed simultaneous measurement of both EC [Ca2+]i and vascular displacement in an opened vascular preparation. The goal of this study is to establish a firm relationship between rat aortic EC [Ca2+]i elevation and vascular contractility by using a receptor-mediated agonist (acetylcholine, ACh) and a receptor-independent agonist (ionomycin). Furthermore, similar approaches were carried out under the conditions that either the EC [Ca2+]i was reduced by exposing the specimen to a calcium-free solution, or its elevation was prevented by a calcium chelator pretreatment. In our system using rat aortic en face preparations, neither EC [Ca2+]i elevation nor vasodilatation was observed during or at the onset of flow. When exposed to phenylephrine (PE), the specimen contracted immediately and reached maximal within a few min without alteration of EC [Ca2+]i (Fig. 1c, initial contraction phase of Fig. 2). When various concentrations of ACh or ionomycin were added to the preparation, we observed EC [Ca2+]i elevations that were followed by vascular dilatation (Fig. 2). Both the elevation of EC [Ca2+]i and the subsequent vasodilation occurred in a dose-dependent manner. While vasorelaxation was very sensitive to low concentrations of agonists, it became saturated at high concentrations. 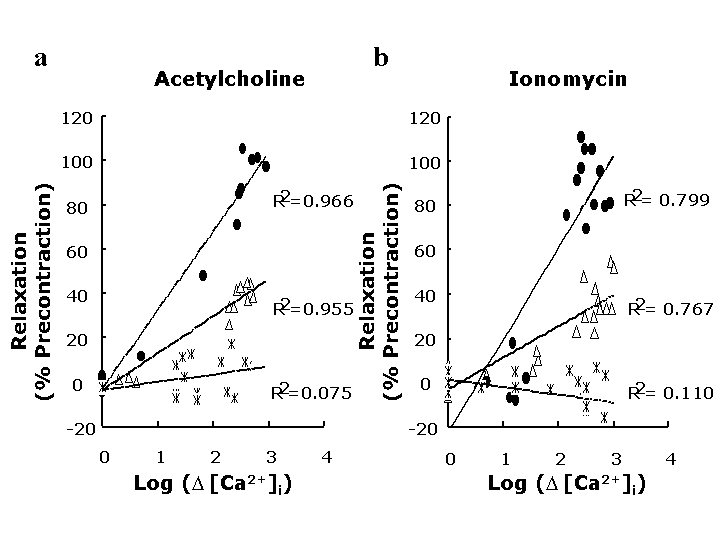 As a comparison, the EC [Ca2+]i level progressively increases in response to increasing concentrations of either ACh or ionomycin. Agonist-induced EC [Ca2+]i elevation and vasorelaxation. 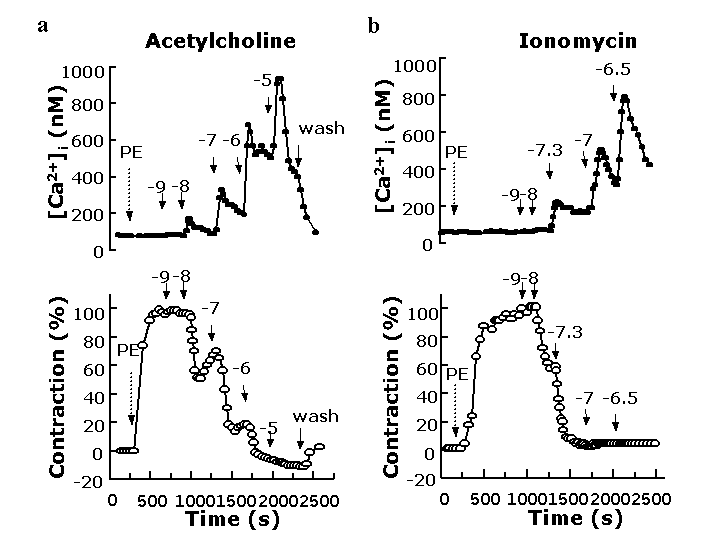 A typical example of endothelial [Ca2+]i and corresponding vascular response to cumulative concentrations of ACh (a) or ionomycin (b) in a PE pre-contracted aortic en face preparation. The dash and solid arrows indicate the time of application of PE and agonists, respectively. Both agonist-induced EC [Ca2+]i elevation (●) and corresponding vasorelaxation (○) increase in a dose-dependent manner. Summarized results of EC [Ca2+]i and concomitant vessel dilatation in the presence of cumulatively increasing of agonists are shown at Fig 3. To examine the relative importance of various endothelial autacoids in our system, the preparations were incubated in the presence or absence of a combination of endothelial autacoid inhibitors. The relative contribution of a specific endothelial autacoid was estimated by performing experiments in the presence of the inhibitors of another two endothelial autacoids. The most potent agonist-induced endothelial autacoid in rat aortae appeared to be NO, which by itself was able to contribute agonist-induced vessel dilatation completely. As a comparison, the L-NNA/indomethacin-insensitive factor(s) alone resulted in 40% vasodilatation at most, whereas PGI2 played insignificant role in this system. Agonist-evoked EC [Ca2+]i elevation and vascular relaxation. 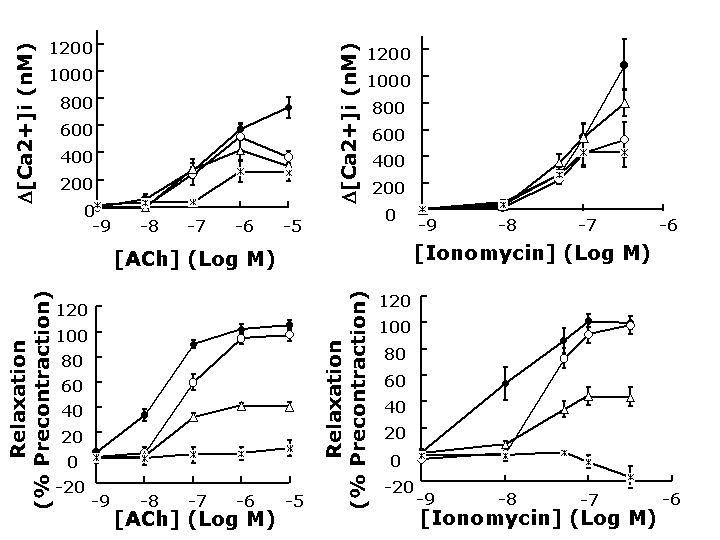 Various combinations of endothelial autacoid inhibitors (10-4 mol/L L-NNA, 3 × 10-5 mol/L barium sulfate and 10-3 mol/L ouabain, and 10-5 mol/L indomethacin) were included in either ACh (a) or ionomycin (b) experiments to block various endothelial autacoids. (●): control in the absence of inhibitors; (○): contribution of NO in the presence of barium sulfate/ouabain and indomethacin; (Δ): contribution of L-NNA/indomethacin-insensitive dilatation in the presence of L-NNA and indomethacin; (*): contribution of PGI2 in the presence of L-NNA and barium sulfate/ouabain. When the ACh-evoked increase of EC [Ca2+]i was plotted against the extent of corresponding vascular relaxation, the curve was log-linear and it was almost identical to that from ionomycin experiments (Fig. 4). No apparent threshold value was observed in either agonist treatment, indicating a drastic increase in vasorelaxation occurred at a minimal increase of EC [Ca2+]i. The half-maximal relaxation induced by agonist application was accompanied with less than 100 nmol/L increase of EC [Ca2+]i. High doses of ionomycin evoked EC [Ca2+]i elevation to the micro-molar range without further dilating the vessel preparations. Moreover, the EC [Ca2+]i-vasodilatation curves from ACh (Fig. 5a) or ionomycin (Fig. 5b) treatments were similar to each other under any inhibitor combination of endothelial autacoids. Relationship between EC [Ca2+]i elevation (abscissa) and vascular relaxation (ordinate). Experiments were carried out in the absence of endothelial autacoid inhibitors. Results were taken from the control experiments in Fig. 3. 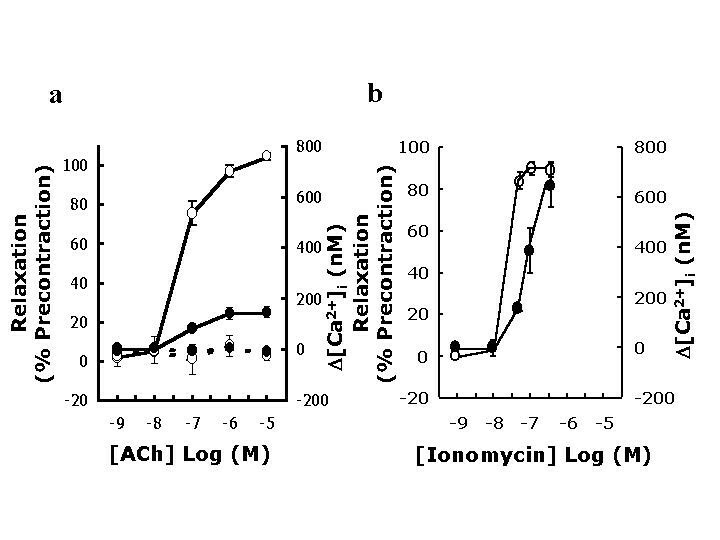 The lines in (a) and (b) were the fitting curves of ACh and ionomycin groups, respectively. Relative contribution of various endothelial autacoids in agonist-evoked EC [Ca2+]i elevation (abscissa) and vascular relaxation (ordinate). Results were taken from inhibitor experiments in Fig. 3. (●): contribution of NO; (○): contribution of L-NNA/indomethacin- insensitive dilatation; (*): contribution of PGI2. In order to examine the role of basal EC [Ca2+]i level in the regulation of vascular tone, PE-precontracted vascular preparations were subsequently exposed to the calcium-free solution followed by ACh (Fig. 6). As mentioned earlier, when the vascular preparation was exposed to 50 nmol/L PE, it contracted without concomitant endothelial [Ca2+]i elevation. When the preparation encountered the calcium-free solution, it contracted further with diminution of the basal EC [Ca2+]i level. The application of 10-7 mol/L ACh, which would almost fully dilate the vascular preparation under normal conditions, induced marginal EC [Ca2+]i elevation and vasorelaxation (Fig. 6a). Results from this part of study are summarized in Table 1. The PE-precontracted aortic en face preparations contracted further (almost 2-fold) by the exposure to a calcium-free solution, whereas the average basal EC [Ca2+]i decrease was about 35 nmol/L. The role of endothelial autacoids in these calcium-free solution effects was further examined by performing similar experiments in the presence of all endothelial autacoid inhibitors (Fig. 6b). 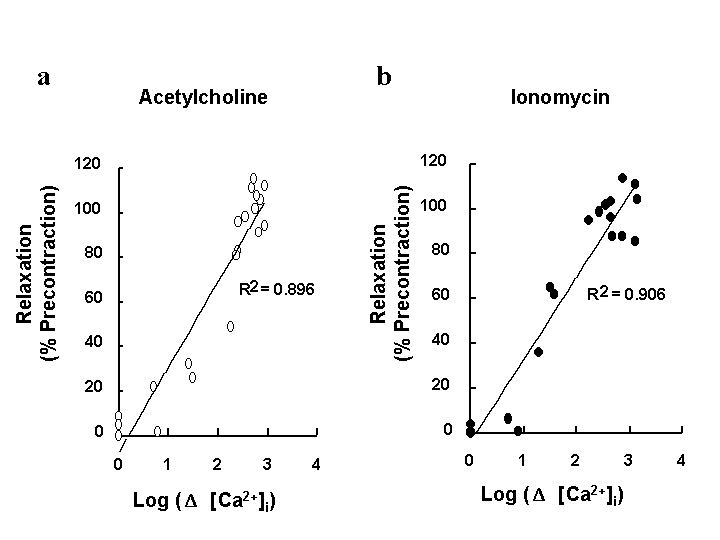 Pretreatment of endothelial autacoid inhibitors prevented further vasoconstriction induced by the calcium-free solution without affecting EC [Ca2+]i depression (table 1, n = 5), indicating that the calcium-free solution-induced vasoconstriction was attributed to the reduction of endothelial autacoids. When endothelium-denuded preparations were used, the vascular tone did not increase by the exposure to calcium-free solution. In denuded preparations, many vessel segments gradually dilated when exposed to the calcium-free solution, possibly due to the delayed reduction of [Ca2+]i level in smooth muscle cells (data not shown). Effects of phenylephrine and calcium-free Krebs-Ringer buffer on EC [Ca2+]i and corresponding vasoconstriction. Effects of PE and calcium-free Krebs-Ringer buffer on EC [Ca2+]i (●) and corresponding vasoconstriction (○). The aortic en face preparations were precontracted by 5 × 10-8 mol/L PE and subsequently exposed to calcium-free Krebs-Ringer buffer and 10-7 mol/L ACh (a). Experiments were carried out using intact preparation in the absence (a) or presence (b) of all endothelial autacoid inhibitors. In order to investigate whether the EC [Ca2+]i elevation was necessary for agonist-induced vasorelaxation, the vessel preparation was pretreated with either 20 μmol/L or 40 μmol/L of dimethyl 1,2-bis (2-aminophenoxy) ethane-N, N, N', N'-tetraacetic acid-acetoxymethyl ester (BAPTA-AM), a calcium chelator, for 45 minutes before the exposure to either ACh or ionomycin. When pretreated with 20 μmol/L of BAPTA-AM, the dose-response curves of ACh-induced [Ca2+]i elevation were shifted to the right and the maximal value of EC [Ca2+]i elevation was less than 200 nmol/L (Fig. 7a). Nevertheless, maximal vasorelaxation could be reached. These results provide the evidence that only small EC [Ca2+]i elevations were needed to induce a large vasodilatation. Both ACh-evoked EC [Ca2+]i elevation and vasodilatation were completely blocked when the preparations were pretreated with 40 μmol/L of BAPTA-AM (Fig. 7a). In the absence of inhibitors, ionomycin at 10-8 mol/L was capable of inducing 60 nmol/L EC [Ca2+]i elevation and 50% vasorelaxation under normal conditions (Fig. 3b). However, at the same concentration it failed to evoke any response in the preparations pretreated with 20 μmol/L of BAPTA-AM (Fig. 7b). When exposed to 5 × 10-8 mol/L ionomycin, this preparation remained unresponsive for the first couple minutes then it responded by a gradual increase of EC [Ca2+]i with concomitant vasorelaxation to almost maximal extent. The preparation pretreated with 40 μmol/L of BAPTA-AM was rather unstable when ionomycin was added. We have successfully developed a technique which allows simultaneous measurements of both EC [Ca2+]i and vascular displacement in a tissue flow chamber system. Perhaps due to technical difficulties, studies on EC [Ca2+]i and simultaneous measurements of vascular contractility have not been very popular. Although a few studies have reported the measurement of EC [Ca2+]i level on intact vessels [13,14,15], results from these studies may be confounded by the fluorescent signal from smooth muscle cells or by the relatively poor signal-to-noise ratio due to light transmission through layers of smooth muscle cells. Consequently, the absolute values of EC [Ca2+]i in vascular tissues are not reported. As a comparison, the fluorescence signal from our optical system only comes from endothelial cells . Moreover, since the fluorescence signal remained strong for hours, this made the characterization of both agonist-induced EC [Ca2+]i elevation and downstream vascular response possible. Some previous studies have reported that flow induces endothelial NO synthase phosphorylation or Ca2+ entry, which in turn leads to the formation of NO and vasorelaxation in rat arterioles and rabbit aortae and coronary arteries [13,14,16,17]. However, endothelial responses to flow may be variable in different vessels or species. Other studies have shown flow-induced vasoconstriction in rat femoral arteries and rabbit resistant arteries [18,19]. In this study using isolated rat aortae, neither EC [Ca2+]i elevation nor vasodilatation was observed during or at the onset of flow. Thus, the constant flow applied throughout our experiments was not likely to induce a Ca2+-indpendent endothelial NO synthase activation. We hypothesize that EC [Ca2+]i may play an integration role in the regulation of vascular tone. A schematic conclusion of present study (Fig. 8) is based on the following convergent observations. Regardless receptor dependent or not, the agonist-induced vasorelaxation was quantitatively correlated with EC [Ca2+]i level in rat aorta, suggesting a decisive role of EC [Ca2+]i signaling on vasorelaxation. Besides, when the EC [Ca2+]i elevation was completely suppressed by pretreatment of 40 μmol/L BAPTA-AM, the ACh-induced vasorelaxation was inhibited as well (Fig. 7a). This result indicated that ACh- induced vasorelaxation required an increase of EC [Ca2+]i level. When the rat aortic tissue was exposed to a calcium free solution, a drastic vasoconstriction was observed along with a small reduction of basal EC [Ca2+]i level, implying that the basal secretion of endothelial autacoids was also modulated by EC [Ca2+]i level. Consistent with our finding, the calcium-free solution also induced vasoconstriction in rabbit carotid artery . Since it has been established that endothelial NO is constitutively released even in the absence of agonist , our results further suggested that EC basal [Ca2+]i level may play an important role in the regulation of basal release of NO. Schematic representation of various EC [Ca2+]i levels and corresponding vessel tone. See text for detail. Although there might be multiple explanations for the vasoconstriction induced by a calcium-free solution, it is most likely due to suppressed EC [Ca2+]i -dependent release of endothelial autacoids under unstimulated conditions. First, this vasoconstriction is accompanied with a concomitant EC [Ca2+]i reduction (Fig. 6). Second, it could be completely blocked by the presence of endothelial autacoids inhibitors (Fig. 6). Third, if the neurotransmitter release from nerve terminals was blocked by exposure to a calcium free solution, the vessel segments should dilate instead. Similarly, if the calcium-free solution affected the smooth muscle cells, the vessel segments should dilate as well. Vessel dilation actually happened when exposed to calcium-free solution for prolonged time periods (data not shown). Therefore, the basal release of endothelial autacoids appeared to be modulated by the basal EC [Ca2+]i level. Like in many non-excitable cells, the store-operated capacitative calcium entry in ECs is the main mechanism responsible for the agonist-induced calcium entry [21,22]. 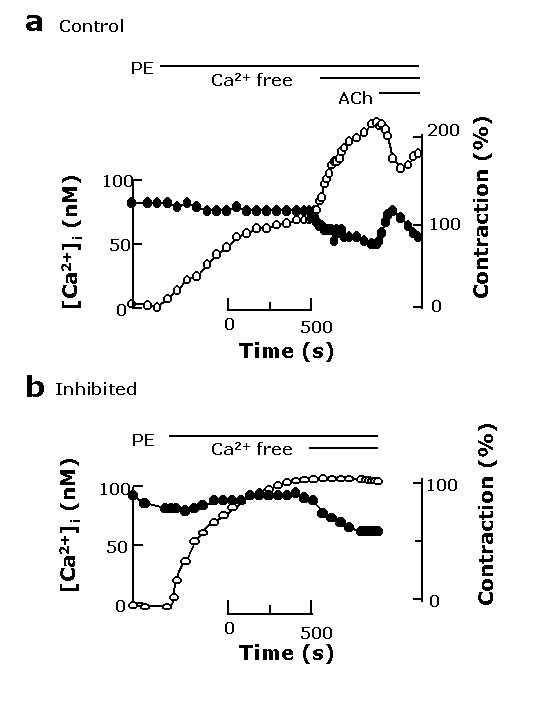 Since the ACh-induced vasorelaxation and EC [Ca2+]i elevation were relatively small under calcium-free conditions (Fig. 6a), calcium influx appeared to be the major source of EC [Ca2+]i elevation and played a major role in modulating the endothelium-dependent vasorelaxation. It is interesting to find that the agonist-induced EC [Ca2+]i elevation, most likely the capacitative calcium entry, was suppressed in the presence of autacoids inhibitors such as L-NNA, indomethacin, or ouabain and barium (Fig 3). Various factors, including NO, cytochrome P450, membrane potential, and protein tyrosine kinase inhibitors, have been reported to affect the capacitative calcium entry . Our findings support the notion that the effect of endothelial autacoid inhibitors on vasorelaxation might be partially due to the modulation of capacitative calcium entry into endothelial cells. It has been proposed that NO synthesis can be activated through calcium independent manner during mechanical stretch of cultured human ECs  or during isometric contraction of rabbit aortic rings . Although a sustained increase of NO secretion has been observed after mechanical stimulation of cultured ECs , it may be actually mediated by small increases in EC [Ca2+]i level. Moreover, since L-NNA could potentially suppress EC [Ca2+]i level, the interpretation of L-NNA induced vasoconstriction as the calcium-independent activation of endothelial NOS  might not be entirely appropriate. In our opinion, the role of basal EC [Ca2+]i in regulating NO production could be overlooked in studies without directly monitoring the EC [Ca2+]i level. We used L-NNA and indomethacin as inhibitors of NO, and PGI2, respectively. Although others and we have shown that the combination of L-NNA and indomethacin almost completely abolish the ACh-induced vasorelaxation [24,25], a 40% of L-NNA/indomethacin-insensitive dilatation was observed in this study. Despite the uncertain identity of the 'L-NNA/indomethacin-insensitive factor' here, the ouabain/barium combination could completely block its dilation effect (Figs. 3 and, 5). Thus the fact that L-NNA/indomethacin-insensitive dilation contributed to a significant portion of agonist-induced vasorelaxation in the current setup cannot be explained by our choice of inhibitors used. We believe that this discrepancy is largely due to the higher sensitivity of vascular contractility measurement in our current open preparation than in the conventional vessel ring preparation. In the absence of any inhibitors, while ACh at 10-8 mol/L induced about 35% displacement of opened vessel segment (Fig. 3), only about 10% tension reduction was observed in vessel rings . In conclusion, agonist-induced vasorelaxation depends on subtle changes of EC [Ca2+]i level and basal EC [Ca2+]i level modulates basal autacoids secretion. The EC [Ca2+]i varies from a basal level of less than 100 nmol/L up to 1000 nmol/L upon full stimulation by ACh or ionomycin and down to 50 nmol/L in calcium-free solution. Major changes of aortic contractility occurs when the EC [Ca2+]i level varies between 50 nmol/L and 200 nmol/L. This study was conducted in conformity with the policies and procedures detailed in the "Guide for Animal Care and Use of Laboratory Animals". Male Wistar rats (6-8 weeks old) were anesthetized by ether inhalation, and their thoracic aortae were immediately obtained. Aortic rings (5 mm long) were immersed in an organ chamber containing Krebs-Ringer solution (118.0 NaCl, 4.8 KCl, 2.5 CaCl2, 1.2 MgSO4, 1.2 KH2PO4, 24 NaHCO3, 0.03 Na2-EDTA, and 11.0 glucose in mmol/L, pH 7.4) and gassed with 95% O2-5% CO2. The rings were labeled for 1 hr at room temperature with 10 μmol/L fura-2 AM in the presence of 0.025% pluronic F-127 . In some experiments, the labeling procedure was carried out in the presence of 20 or 40 μmol/L BAPTA-AM for 45 minutes. The excess chemicals were washed away with Krebs-Ringer solution. 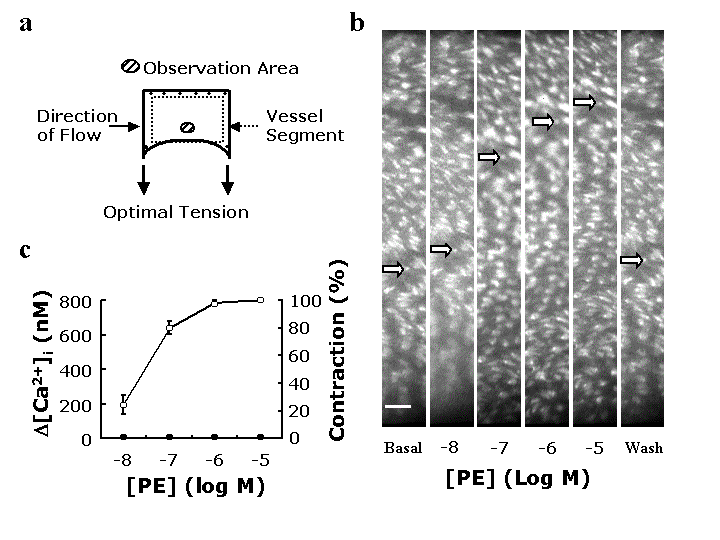 The basic experimental setup for endothelial [Ca2+]i measurement was previously described , with some modification during vessel mounting in order to allow simultaneous measurement of vascular endothelial [Ca2+]i and vascular smooth muscle contraction. One side of the longitudinally opened vessel segment was fixed in the direction of blood flow with insect pins. The corners on the opposite side were passively stretched to an optimal tension (4 g) and pinned onto the base plate (Fig. 1a). Thus, this arrangement allows free vessel movement in response to the addition of vasoactive chemicals. After vessel mounting, the flow chamber was placed on the microscope stage and perfused with Krebs-Ringer buffer at 30°C under a constant flow rate of 700 μl/min (estimated shear stress 3 dyne/cm2) for an equilibration period of 1 hr. The agonist-induced EC [Ca2+]i elevation and vascular activity were determined in the presence of 50 nmol/L PE, followed by subsequent exposure to cumulative ACh (10-9 - 10-5mol/L) or ionomycin (10 -9 - 3 × 10-6 mol/L). The relative movement of endothelial cells was used as an index of vascular tone, whereas fluorescence ratio images from fura-2 labeled endothelial cells provided quantitative information about EC [Ca2+]i. The calibration of endothelial [Ca2+]i in each preparation was described previously . Briefly, at the end of each experiment, the EC [Ca2+]i was calibrated by applying ionomycin (5 μmol/L) in the presence of 5 mmol/L EGTA, followed by 10 mmol/L CaCl2. Finally, manganese (5 mmol/L) was added in order to quench cytosol fura-2 fluorescence. Endothelial [Ca2+]i was estimated after subtracting the background and autofluorescence according to the established formula . Axon image workbench software (Axon Instruments, Foster City, CA, USA) was used for digital image acquisition and EC [Ca2+]i analysis. To calculate the vascular displacement, MetaMorph software (Universal Imaging Corporation, PA, USA) was used to trace and analyze a series of images. The fluorescence image was focused sharply, and a particular endothelial cell in the initial image was selected as a location marker. In the presence of a specific concentration of PE, this image was forced to shift inward during experiments. After the marker had reached its final equilibrium location, the total displacement represented the maximal extent of vascular contraction induced by PE. When the preparation was subsequently exposed to either ACh or ionomycin, the marker moved back towards its initial location, indicating vasorelaxation. The extent of vasodilatation was calculated as the percentage of pre-contraction value. To validate the experimental procedure for the measurement of vessel contractility, we calculated results acquired from different EC markers located within the same calcium image. Although the displacement value of each marker may vary from point to point, the relative movement at each point was identical when normalized by the maximal pre-contraction displacement at that point. Moreover, if we on purposely focused at the free-moving edge where some smooth muscle cells were exposed, the relative movements were identical when either ECs or smooth muscle cells were used as the marker. Therefore, there was no detectable relative movement between ECs and the smooth muscle cells underneath, indicating that the ECs in our preparation were firmly attached to basement membrane. An initial series of experiments were performed on aortic en face preparations for the simultaneous measurement of endothelial [Ca2+]i and vasodilatation in the presence of PE. The endothelial calcium image shifted in a dose-dependent manner to the cumulatively increasing concentration of PE (Fig. 1b). The changes in vascular tone were expressed as a percentage of maximal displacement, which was achieved at a PE concentration of 10 μmol/L. Moreover, the endothelial [Ca2+] i was unaltered during the experimentation (Fig. 1c). 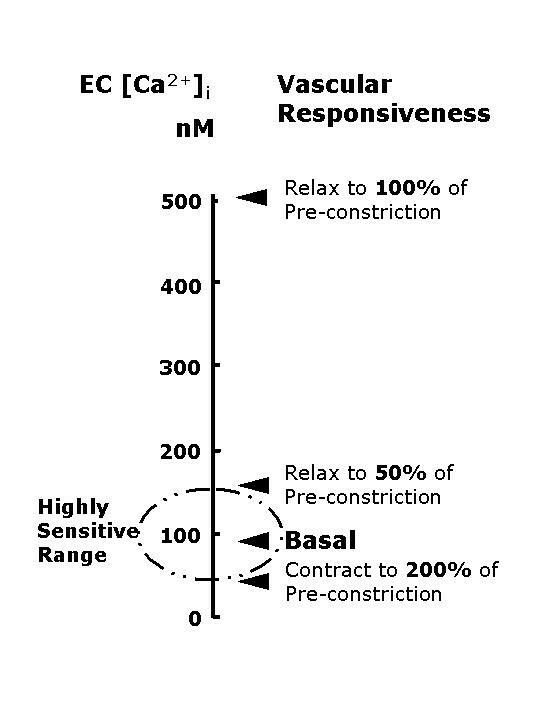 The EC50 of PE was approximately 50 nmol/L; this concentration was thereafter used for the following experiments to test the vascular tone responses to different vasodilators. EC [Ca2+]i and vascular displacement were determined in PE pre-contracted preparation in the presence of cumulative supplement of ACh (a receptor-dependent agonist) or ionomycin (a receptor-independent agonist). In some experiments, various endothelial autacoid inhibitors were applied to evaluate the relative importance of NO, L-NNA/indomethacin-insensitive dilatation, and PGI2 in our system . To investigate the role of basal EC [Ca2+]i level in regulating the vascular tone, PE-precontracted preparations were subsequently exposed to calcium-free buffer in the presence of PE. Reagents for preparing Krebs-Ringer solution were purchased from Merck (Darstadt, Germany). Other reagents were obtained from Sigma (St. Louis, MO, USA). Results were expressed as mean + SEM. Sample sizes were indicated by n. Dose responses of agonist-induced [Ca2+]i elevation were analyzed by ANOVA with a repeated measures design. Differences between two groups were compared by using unpaired Student's t-test with P < 0.05 considered as statistically significant. This work was supported by grants from the National Science Council and National Health Research Institute in Taiwan, R.O.C. (Grant numbers NSC89-2320-B006-034, 070, 125 and NHRI-GT-EX89S834L).